Grilled, marinated steak served in warm tortillas with your favourite toppings like salsa, guacamole, cheese and sour cream. Dinner is always fun when fajitas are served in ‘assemble yourself’ style at the table. Lately I have been craving some Texmex food and since it has been a while since I last had fajitas I was thinking that they would be perfect. Fajitas are Mexican and a Texmex dish where grilled meat, typically beef, is served in a tortilla. The grilled meat is often accompanied by sauteed onions and peppers and the fajitas are finished off with your favourite topping including things like salsa , guacamole , sour cream and shredded cheese. Fajitas are pretty easy to make but you have to plan a bit ahead so that you have time to marinate the meat. After marinating is is as simple as grilling the steak and sauteing the onions and peppers. This is one of those family fun meals where all of the ingredients are served on the table and everybody gets to assemble their own as they like. Although I like to make my own condiments for fajitas, you could easily save to time and effort by using store bought. This time I served my fajitas with a fiery hot habanero salsa , a fresh pico de gallo , a blue cheese guacaole , shredded cheese and sour cream. Marinate the steak in the oil, lime juice, jalapeno, garlic, cumin, oregano, cilantro, salt and pepper in the fridge for 30 minutes to a few hours. Option: Add your favourite fillings like salsa, guacamole, cheese, sour cream, etc. Have never tried Fajitas..u made it sound very easy…Would definitely try it..thanks for inspiring. These look delicious, Kevin. I need to go start dinner asap. You're making me even hungrier! Ok, my stomach is definitely growling! Ha! I just made fajitas today. You and I are on the same wavelength. Yours look absolutely lovely. yum! looks fantastic! xoxo jillian:: don't miss my fishs eddy dish giveaway! Now I'm craving .. always love even the smell of fajitas only overshadowed by the actual taste. This is giving me cravings and it's midnight!!!! Hi Kevin, I love fajitas, thanks for the reminder, we've not have them for ages. I had just made my first "mexican" dish of quesadillas quite by accident and this Fajitas recipe seems like the most logical thing to follow suit with! Looks amazing and flavourful. I was thinking about making fajitas this past week, so it's really perfect timing for you to be posting this! Great marinade for the meat! I'm fascinated by all the extras…blue cheese guacamole and habanero salsa sound so great. The other day I made fish tacos and was reminded how much I like fresh Mexican and Texmex food, thanks for the recipe! I think I could eat these every night of the week….looks delicious! Kevin: Have you tried these with homemade tortillas??? both Confections of a Foodie Bride and Homesick Texan have excellent recipes — worth making the tortillas to take this up a notch! Fajitas are always my pick in tex mex but I never made them. They will be on the menu really soon. penandra: I have not but I now have those two recipes bookmarked to try! It sounds like fun! We love love fajitas. Skirt steak is more traditional, yes, but I prefer flank steak for mine. Gorgeous looking food as always, Kevin. The onions and peppers are cooking right now! So excited to eat this! I have been with you since almost your beginning and I have enjoyed seeing the pictures of all your recipes. They are half the encouragement to try them out. You have truly turned this into a career and because I love your recipes, don’t quit! 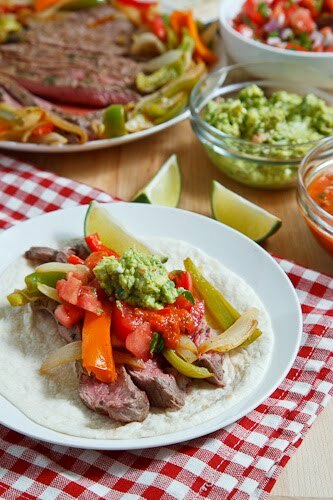 My favorite Fajita recipe is for steak fajitas, I’ll be making these this week with your recipe. My mouth is watering already for them. Thank you.